Ticketmaster has opened a number of good seats in all price categories to the 2nd concert in Toronto on December 5. Our members are allocated a nice mix of tickets. These tickets will be available until 10 PM EDT on October 9. They seem to have really great seats in there that they opened up from unsold VIPs and artist holds. I made a test and was offered a 3rd row ticket. 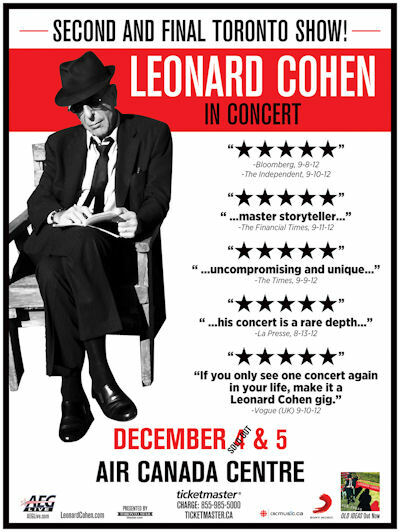 Linda and I have very fond memories....Toronto 2008, our FIRST live Cohen concert and our FIRST meeting face to face with wonderful fan and webmistress, Marie M. Never imagined then that 01-10 would offer so many Cohen pleasures, and that 2012 could also come into play with more opportunities. With really good front seats available, may consider stretching the home equity loan a bit further. Toronto also the site of Book of Longing premier, with Glass and Cohen together, buying Cohen prints from Drabinski, and fascinating tour of Cohen archives in U of Toronto. Think Sylvie also reveled in pleasures of that site. Oops -- almost forgot to mention that Rufus opera also premiered at Luminato festival in Toronto, and that Rufus' partner Jorn now is the director of that popular event.